Just a short post from me, I don’t normally blog about food (despite loving it in a relatively unhealthy way), but last night I was in a hotel room in Leeds and sent a tweet asking for recommendations of places to eat in Leeds. The responses reminded me of all that is ace about twitter, the genuine spontaneous connectedness and knowledge sharing. The options suggested were diverse and plentiful – check them out here. Initially I’d not even been sure that I could be bothered to go out but felt I needed a little adventure. I plumped for Ian’s suggestion of Bundobust because it sounded interesting, was nearby, and to be blunt I had little to go on, he’d not offered any reason as to why…which got me interested. What a result. 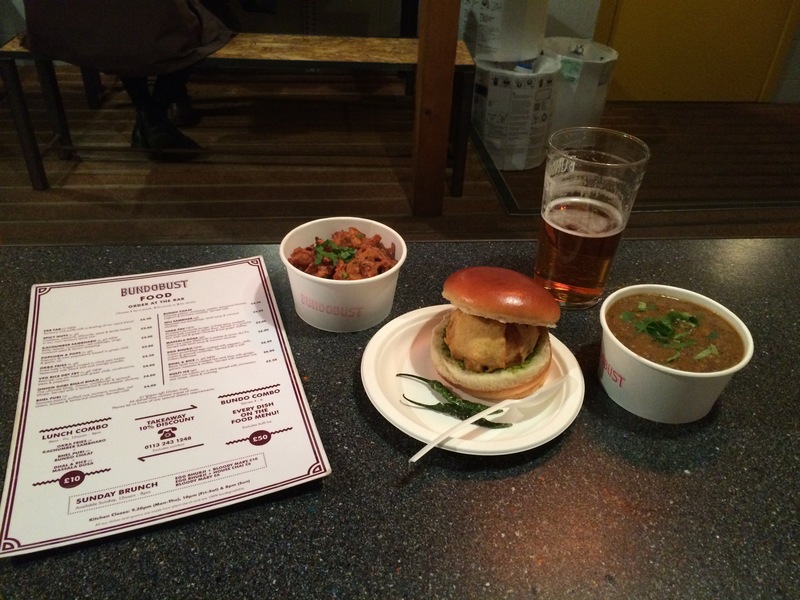 Described as the home of craft beer with an Indian street kitchen – it really didn’t disappoint. It had a sort of quirky feel, a sort of indian wagamamas meets community centre meets trendy pub. It was early evening when I got there and it was already busy, the lovely woman serving/seating people explained it was a bit of a free for all with seats, just hover and grab one, but there was also a yard out back with shelter and outside heaters (it’s way nicer than that makes it sound). Given I was on my own and didn’t really want to take up a prime table spot, and I was hank marving, I grabbed a pint (Camden Pale Ale – very nice, not that I’m a connoisseur) and headed for the yard to skim the menu. Overwhelmed with choice, not because there was too much but just because it all sounded so amazing it was hard to choose, I took the menu advice (1 portion for a snack, 2 for lunch and 3 for dinner) and plumped for Onion Gobi Bhaji Bhaji, a Vada Pav, and Dhal and Rice. It was amazing, seriously good food. The sort of food where you can taste all the flavours and you feel like you’re nourishing your soul, not just taking on fuel!! I couldn’t finish it all so some of the potato burger was left but I couldn’t leave any of the black lentil dhal, in fact if/when I return I’ll just order a bucket of it, it was that good. The food was awesome, the staff friendly and helpful, free wifi and people watching galore (two first dates – one more of a success than the other, a couple of hipsters talking brewing, and a gaggle of work colleagues). The only dampener on the whole experience was the seriously arrogant guy who ordered before me at the bar. He barked his requests at the barmaid, didn’t stop fondling his phone, failed to make eye contact with her as she passed him the card machine and didn’t even say thank you. I hate rudeness and was sorely tempted to say something, but decided to let it go, but please people we all know it’s great to be connected but please never be such arses at a bar. Hats off to the almost saint like customer service skills on offer. If you ever find yourself in Leeds looking for lunch or dinner, you could do far worse than a trip to Bundobust. Nom nom nom.